NASA's Messenger probe delivers impressive new views of the inner-most planet, which is in some respects harder to reach than distant Pluto. Global map, in monochrome and color, captures all of Mercury in detail for the first time. Laurel, Maryland—On the appointed afternoon last March 17, as the Messenger ﻿spacecraft prepared to insert itself into orbit around Mercury, the Johns Hopkins University Applied Physics Laboratory braced for hundreds of visitors intent on sharing the historic moment. The lab—called by its acronym APL (rhymes with JPL, as in the NASA facility on the West Coast)—lies on a bucolic campus halfway between Baltimore and Washington, D.C. Most of the facility’s 400 acres are restricted, including the areas dedicated to the construction of marvels such as Messenger and the New Horizons spacecraft now heading for a 2015 rendezvous with Pluto. Aside from anxiously anticipating the evening’s crucial maneuver, Messenger project manager Peter Bedini was concerned about granting his official guests the prime viewing positions they coveted inside the tense, cramped quarters of the Mission Operations Center, APL’s version of Mission Control. The difficulty of orbiting Mercury, the solar system’s innermost planet, has discouraged attempts until now. To catch Mercury in its tight orbit around the sun, a spacecraft must change speed by more than 60,000 miles an hour after leaving Earth, difficult to do with rocket propulsion alone. To meet the planet at the proper speed, Messenger had to ply a looping, roundabout route. After its August 2004 launch from Cape Canaveral, the spacecraft began circling the sun on a constantly shifting course, flying by Earth once (in 2005) and then Venus twice (2006 and 2007), in order to narrow its orbit and lose a little momentum at each planetary encounter. By the time it reached Mercury’s vicinity (in January 2008), it was still traveling much too fast to be pulled into orbit around the little world. So Messenger continued to circle the sun, brushing past Mercury two more times (in October 2008 and September 2009) to further brake its speed. Messenger scientists, from principal investigator Sean Solomon of the Carnegie Institution for Science to mission systems engineer Eric Finnegan at APL, view underexplored Mercury as the key to understanding the evolution of the terrestrial, or Earthlike, planets. Its ancient surface, largely untouched by the weathering effects that have altered the faces of Venus, Earth, and Mars over eons of change, is thought to preserve the best memories of the solar system’s formation. Mercury further commands attention as the smallest and densest of the rocky planets. Despite being just over one-third the diameter of Earth, Mercury maintains a partially molten iron core that generates a global magnetic field—something neither Mars nor Venus can claim. Mercury also has the widest variation in surface temperature of any planet in the solar system: hot enough at the equator in daytime to melt lead, cold enough in shadowed craters near the poles to keep ice in long-term storage. The near-Mercury environment, hostile in the extreme, is dominated by solar intensity 11 times the dose that Earth receives. Messenger wears a full-length sunshade over one side of its body for protection against the inferno-like conditions. The shade mimics the texture and flexibility of sturdy canvas but consists of ceramic compounds spun into ultrafine fibers and woven together for this unique purpose. Bedini had a sample of it on his desk when I met with him and fingered it with amazement. Only a fraction of an inch thick, the shade will allow the spacecraft’s seven instruments to operate at room temperature by shielding them from heat typically found “inside an oven on the self-clean cycle.” The spacecraft’s solar panels will poke out from behind the sunshade at an angle, so as not to be overwhelmed by heat, and need merely sip from the superabundance of available solar energy. Messenger’s engineers have protected its instruments not only from direct exposure to the sun’s rays but also from the tremendous heat reflected by the planet’s surface, which reaches 800 degrees Fahrenheit over the long Mercury day. (The planet revolves around the sun rapidly, in only 88 Earth days, but rotates so slowly on its axis that a single day-night cycle on Mercury takes almost six months.) The camera built to focus on these scorched plains sits in a pound of paraffin that should alternately melt, to absorb heat, and then refreeze when the spacecraft reaches the darkness of the planet’s shadow or gains distance from Mercury on the extremely elliptical orbit devised for it—approaching within 125 miles of the surface before retreating to a cool distance of nearly 9,500 miles. Messenger stands for MErcury Surface, Space ENvironment, GEochemistry, and Ranging, a summary of its ambitious mission agenda and a bow to the mythological Mercury’s work as messenger of the gods. In addition to wide- and narrow-angle cameras, the craft’s payload includes instruments to determine the elemental makeup of the planet’s crust, measure the magnetic field, and parse the composition of its ultra-rarefied atmosphere. A laser altimeter will gauge the height of the surface eight times a second as the craft moves, discovering the precise location and dimension of impact craters, volcanic terrain, and other three-dimensional structures. None of these instruments, however, will function during tonight’s burn sequence. All systems must be shut down—even the all-important fault-protection system that normally alerts controllers to danger and halts other systems when it sees fit. Since the burn constitutes an unusual condition, fault protection might stop the process midway, sabotaging the remainder of the mission. During Messenger’s three Mercury flybys of 2008 and 2009, it mapped and imaged never-before-seen sectors of the planet’s surface. The sole other spacecraft ever to get anywhere near Mercury—Mariner 10, more than 30 years ago—glimpsed only half the Mercurian landscape. The recent return saw the planet’s cratered surface, which had looked as long-dead as our own moon, come alive. Messenger identified multicolored lava deposits, a sign of relatively recent volcanic activity. Each time it passed by Mercury, Messenger noted a different configuration and agitation level of the planet’s magnetosphere, the magnetic envelope that deflects the particles blowing off the sun. On its third flyby, Messenger observed Mercury’s magnetic field changing rapidly in response to the shifting solar wind, causing magnetic fluctuations that, on Earth, would render a compass useless. The flybys have gathered so much new data that some say they have already justified the mission’s cost, even if tonight should end in disaster. But achieving orbit will allow Messenger to take photos as much as 10 times more precise than flyby images. And the leisure afforded by a yearlong sojourn in orbit will produce a further bounty of data bound to answer the mission’s primary questions: Why is Mercury so dense? What is its geologic history? How does the planet’s atmosphere work, and why does it have a magnetic field? Perhaps just as important, Messenger could shed light on other Earthlike exoplanets, many of which circle even closer to their host stars. “Mercury is our nearest laboratory for studying planets that formed and evolved near their stars,” Solomon says. Everyone working here at APL has reason to feel jumpy, despite Messenger’s stellar performance to date. What if something goes wrong? It was only last December that the Japanese probe Akatsuki sailed past Venus instead of entering orbit around it as intended. Mercury, closer to the sun and orbiting faster than Venus, is generally regarded as a more difficult target. “There are a couple of things that could make this a very bad night,” Bedini conceded. “If, for one reason or another, we find ourselves still in a heliocentric orbit [going around the sun instead of the planet] after tonight’s burn, there are ways of recovering. But they’re not very attractive.” Should Messenger miss this window of opportunity, it could take two years—or six years, or more—to realign the craft for a second chance at shifting from sun orbit to Mercury orbit. Planet Mercury was making a favorable naked-eye appearance in the western sky at dusk, when the doors of the APL’s 500-seat auditorium in the Kossiakoff Center opened to the public. Inside, a fully equipped camera crew lent the proceedings the air of a talk show being taped before a live audience. An APL media relations staffer provided running commentary, coordinating live feeds from mission control and conducting onstage interviews with a few of the Messenger scientists and engineers. The start of the burn drew claps. Midway through the burn, a large screen offered the view from a webcam inside the Mission Operations Center. The core team, whom the announcer had just described as “highly excited,” sat frozen in tableau, as though hardly daring to breathe. The audience laughed at this unlikely display of “excitement,” but all sympathized with the restraint on the scientists’ faces. Most in attendance realized that rapid change in Messenger’s velocity could briefly cause the Deep Space Network to lose track of its beacon, leaving human handlers clueless as to its status—or that of their own future research opportunities. But that never happened. Instead there were two moments of relief inside the Mission Operations Center: first when the burn made it past the 70 percent marker, which meant that Messenger had at least made it into orbit, and then—the bigger relief—when the 15-minute burn ended. That’s when the team shook hands, although it was another half hour before the data started to flow and the operation was declared successful, eliciting widespread applause. Bedini and the rest of the team still looked tentative. They knew they couldn’t give genuine sighs of relief for a few more hours. They were planning to stay up all night, waiting for Messenger to reach the farthest point, or apoapse, of its new anticipated Mercury orbit. If the craft got to that point, then they could be confident it would go the whole year’s distance—looping around Mercury once every 12 hours, periodically correcting its orbit, and repeatedly reorienting itself in space to point its instruments on target, turn its shaded cheek to the sun, and beam its findings back to Earth. ° Previously unknown hollows dot Mercury’s surface. The depressions may have formed when volatile compounds suddenly sublimated into gas. That could mean the planet contains more easily vaporized elements than scientists had predicted. ° Smooth, volcanic plains stretch over a large region near Mercury’s north pole. Lava flows cover more than 40 percent of the planet, indicating extensive and relatively recent volcanism. ° Mercury’s surface composition is different from that of the other rocky planets, with 10 times as much sulfur as Earth’s crust. The odd composition means that scientists will have to rethink their models of how Mercury formed. 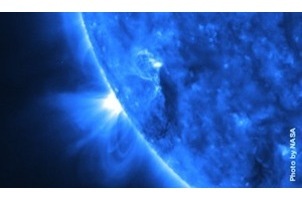 ° The planet’s magnetic field is strangely uneven, especially relative to its size. Scientists cannot yet explain the asymmetry, but doing so should help them understand what is churning in Mercury’s dense, iron-rich interior.